It can be tempting to focus on account executives as the stars of your sales team; after all, they're the ones who close deals and bring in revenue. 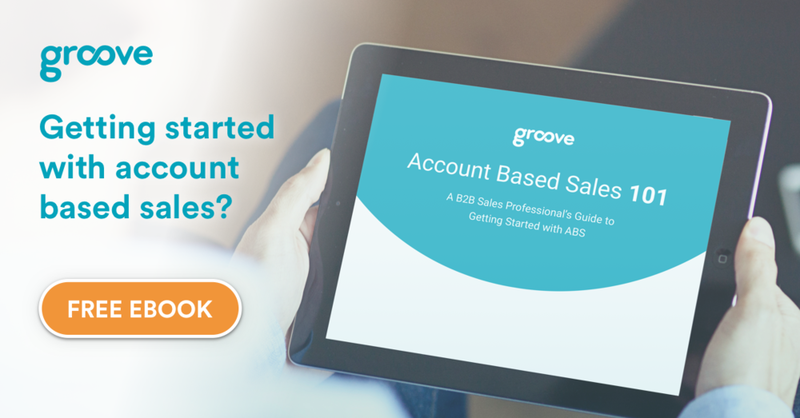 But in an account based sales approach, every part of the sales pipeline is critical to your success — especially the folks who first speak to potential buyers, your SDRs. Ultimately, it's the SDR's job to find the right contacts and keep them moving along the sales pipeline, setting account executives up for meetings and demos. However, that looks a little different in an account based sales program than in a traditional sales program. In traditional sales, the role tends to be a free-for-all, with each SDR working in isolation on any lead that comes their way. In an account based sales program, an entire team strategizes together on a set of targeted accounts — the companies that are the best fit for your product or service. In this context, your SDRs are the first line of people that show sales prospects that you're a company of genuine human beings that want to help solve their pain points, as opposed to "pushy sales types" that are only looking to take their money. The best SDRs have a knack for relating to people and building relationships, approaching each interaction with the genuine intent of learning about the prospect's challenges and then delivering real value and solutions, regardless of whether a sale actually gets made. Often, SDRs are early in their careers, and hungry and energetic. Ideally, you want to hire them for the role as much as for the company culture, and see them graduate to be an account executive or customer success manager. That said, because this is many peoples' first job, some degree of turnover is inevitable. My advice is to keep a bench of promising candidates in the queue, either in junior roles or in active interviews. If you're building your team from scratch, consider hiring SDRs in pairs so that they have someone down in the trenches with them; or pair them with senior SDRs who can coach them through the onboarding process. In my experience, the best person to manage a team of SDRs is a seasoned SDR — someone who has similar experience and can get into the weeds with the team. Once your SDRs are up-to-speed, make sure they have plenty of one-on-one peer time, sans managers, to exchange and cultivate ideas. The ideal proportion of SDRs to AEs varies. A one-to-one ratio is makes sense in many situations, allowing an SDR and AE to work closely together on their target accounts. But some startups will have as many as three SDRs for each AE. It's about finding a balance between the leads generated and how much any given AE can handle — keep an eye on the numbers and make adjustments accordingly. Being an SDR can be tough at times, so keeping them motivated and interested has to be a priority. You can gamify sales by introducing leaderboards, in-house competitions, and fun spiffs (for example, if you meet 200% of your sales quota, you win a dinner for two at a nice restaurant) to keep it interesting. And I recommend having a clear scale for compensation. It's about striking a balance between monetary rewards and creating a fun, competitive environment where your team feels motivated and energized to do their best in what can be (at times) a grueling role. Motivation, a full commitment to your product or service, and that special human touch are all essential to the SDR role — but they can't succeed on gumption alone. If you want your SDRs to shine, the key is thoughtful onboarding. Your ideal customer profile (ICP): The characteristics (size, location, industry, etc.) of companies that stand to benefit most from what you're selling. The ICP is how you decide whether a company should be on your list of targeted accounts. Your buyer personas: The various roles within your target companies that will decide whether to purchase your product, as well as what they do, typical pain points, and any other info that might help you understand their experience and relate to them on a deeper level. Once your SDRs know who you're targeting, you can support them with rich data from your CRM, example messaging, and your battle-tested sales strategies. But ultimately, onboarding and training is the key to helping them steer their own outreach strategies and create the highest-quality contacts possible. Attainment against quota: How many meetings and demos have they generated versus their goal? Quality of outreach: How many of their calls connect? What percentage of their emails are opened or receive replies? When given the right training, motivation, and support, your SDRs are the foundation of providing a solid customer experience from the first touch. While they may be lost in the free-for-all nature of a traditional sales approach, with ABS, your SDR becomes the mastermind of your outreach cadences, connecting your sales department to the strategies of the marketing department, then handing the best-qualified prospects off to the AE for closing.